Crowded on Gurnard but got a good start inside Black Diamond who had to virtually stop on the line to prevent being over. Sheets eased down the Solent with the tide under us and a lightish North Easterly. Kept over the Island side of the main channel with a few boats going further over but it did not seem to be to any advantage. Were able to get the Code Alpha up as the wind came round and made some gains on our main rivals with Long Pierre, Black Diamond and Raffles out front. Round Owers and headed back against the tide and got the Code Alpha back up but after a while it was possible to swap to the big spinnaker which gave us some extra speed. By this time we were dicing with Blazer at close quarters with Alchemist and the others well back. Nip & tuck up to Gleeds but managed to pull away from Blazer on the final run into the finish with some well executed jibes. 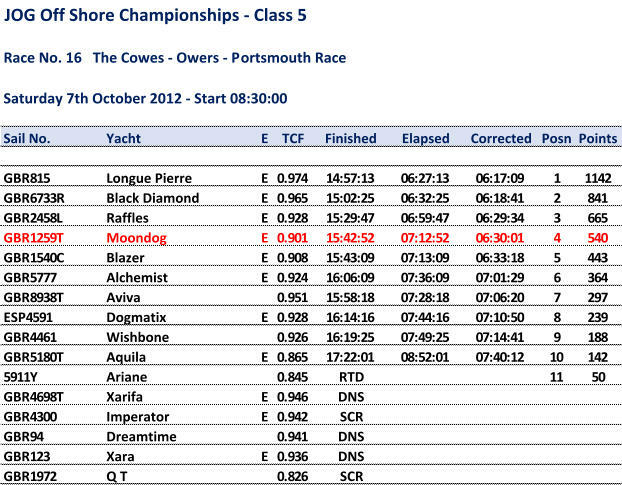 Nearly had Raffles on corrected but not too shabby with a forth which also confirmed a forth in the In Shore series.